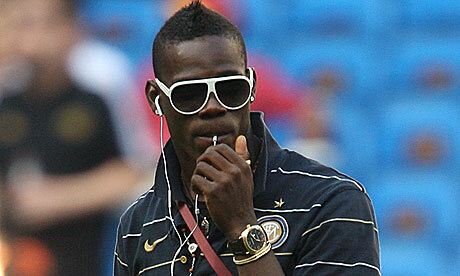 Manchester City boss Roberto Mancini has warned Mario Balotelli he risks throwing away his career. City's patience is wearing thin with the Italian bad-boy. The striker ruined his club's Europa League dream by getting sent off for a crazy kung-***** kick and then threw a dart at some youth players. City boss Mancini said: "He is 20 and at that age people do c**p things. "But maybe now the time has come for him to help himself and to understand the mistakes he is making. "Otherwise he risks throwing away his abilities which are immense. He has scored some beautiful goals this season. "He should think only about expressing his talents on the pitch and leaving to one side the other matters which have nothing to do with football. "If he does not, then everybody in England will begin to make him a target - starting off with the referees. "I understand him and everybody has infinite patience with Mario. Everyone at Manchester City has always helped him and wish him the best." They censored crap like this: c**p. LOL!